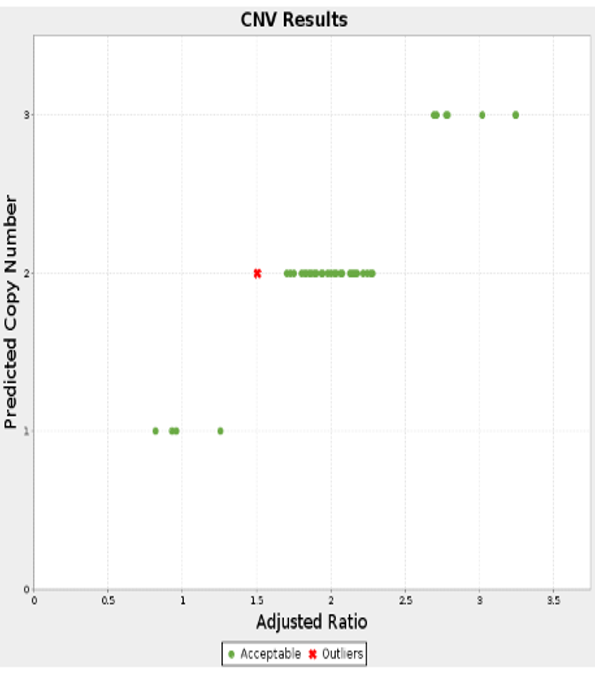 CopyCount-CNV™ analyzes raw fluorescence qPCR data and provides copy number variation results as evidenced in the screenshots below. Applications include transgene copy number and seed zygosity determination among others. CopyCount-CNV™, performs CNV analysis with greater confidence and advanced statistical output. Figure 1: CNV analysis for 48 different seeds. The Y-axis plots the final CNV Call. The X-axis plots the adjusted ratio of the number of DNA copies of the transgene divided by the number of copies of the CNV control. Note that there is good separation between the highest X-value that is called a hemizygote (i.e. CNV=1) and the lowest X-value that is called a homozygote (i.e. CNV=2). There was one seed (indicated by red x) that had an ambiguous call which was automatically detected. 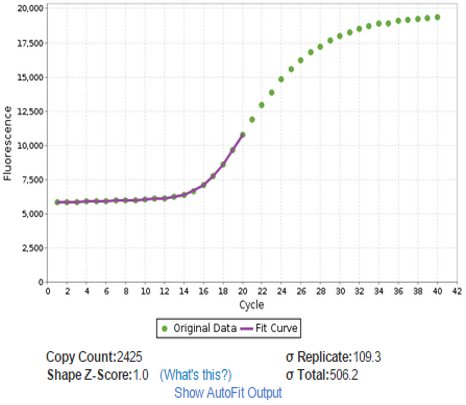 Figure 2: Typical PCR data and curve fit by qPCR CopyCount. Such fitting is used to determine the absolute number of DNA molecules in the reaction at cycle zero, which is 2425 molecules in this reaction done on the transgene. The ratio of the number of copies of the transgene divided by the number of copies of the control is used to determine the copy number (CNV). Reduce ambiguity and marginal calls with CopyCount-CNV™ and the advanced statistical output for your gene of interest (GOI) including the CNV call and relative confidence as well as control average, raw ratio, adjusted ratio, CV of ratio and z-score. Figure 3: The Table of CNV statistics for the 48 seeds. The column labeled “GOI Average” is the number of molecules of DNA from the transgene. The column “Control Average” gives the number of molecules of the CNV control. CopyCount-CNV™ automatically analyzes the data to determine the adjustment factor needed to get the correct CNV call. The final CNV call is in the last column. The confidence level is based upon the area under the cumulative distribution function, which is used to compute the probability that the CNV call is correct (with the exception of the one ambiguous call, all the other calls were >89% probability).